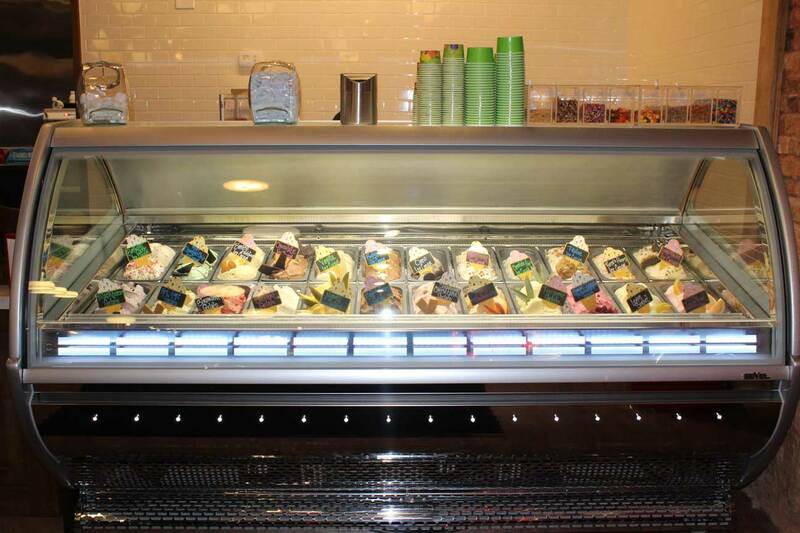 Our Ice Cream and Gelato are handmade in-house! No one can say River Street Sweets • Savannah's Candy Kitchen is afraid to embark on ambitious projects. After all, it all started when an eleven-year old boy spied a fudge pot at a 1978 Atlanta trade show and wouldn't take no for an answer when he insisted fudge-making would be a great fit for the family's gift shop back in Savannah. The rest was history, and now a new chapter has begun. In addition to our world famous pralines, unparalleled saltwater taffy, crunchy peanut brittle, and home-made from-scratch pecan pies, you can buy ice cream. We don't know about you, but for us, no vacation is complete without indulging in a cone piled high with luscious creamy ice cream or a dish of silky smooth gelato. Think back to your last vacation. Which store had a line snaking toward the door, if not out into the street? The ice cream store, of course. Judging by how many people are willing to wait their turn at the counter, we decided we're not the only ones. With this in mind, we made the move to offer homemade ice cream, first at our candy stores, and now at our franchises. But it's not just any ice cream. As would be expected, coming from a family with over 100 years of combined experience in making candy, every flavor of our creamy rich ice cream is made in our kitchen. That goes for our gelato, too. But be warned, choosing a flavor can be an ordeal. Just when customers have perused the list of ice cream flavors, trying to decide between rocky road, birthday cake, banana pudding, cookies-n-cream, or perhaps, good old vanilla they look over and see the gelato flavors. Tiramisu, Pralines-n-cream, or coffee crunch? Key lime pie, lemon sorbet, or pink grapefruit sorbet? It's enough to make a grown man cry. But it's a sweet pain. But then, everything in our stores is sweet. That's what we're all about. If you're curious about how sweet our ice cream is, you can find out at any of our original locations in Charleston or Savannah, as well as our newer stores in Buford, GA, Myrtle Beach, or North Charleston. And, in case you haven't heard, we also have a growing chain of franchises in locations stretching from Key West to Lancaster, PA, as well as locations in between, including Pooler, GA and Greenville, SC, as well as San Antonio, TX, and Asbury Park, NJ (summer 2019)! But don't look now, there are more waiting to open their doors soon.